The owl print is from this Pottery Barn line, I love everything about it. I posted about this on Flickr and so many people were telling me that they LOVED it too, and one awesome person Chen from my Pieced Together Quilting Bee emailed me telling me that she had some of the sheets left over and was willing to swap with me! Whoo Hoo. She wants me to make her a 12" block in exchange for the fabric. I can't wait to start on the block for her, it is on my list of things to do next week. p.s. please don't think I am a slacker I am still waiting for a couple of blocks from the quilting bee to come in the mail and I will then start working on my quilt. I am so excited to put it all together. To help satisfy, here is a quick pic of some of the blocks so far. Sorry about the picture quality, I took it with my iphone. Awesome fabrics! Love the owls and I collect mushrooms (it's a long term project plan) so I'm going to have to go find those now. Hi darci! I love that blog and saw you on there today, way to go girl!! i love the owl fabric, and the other goodies you got. what a fun day! Thanks for the love girls! I suddenly feel the need to run to P.B. 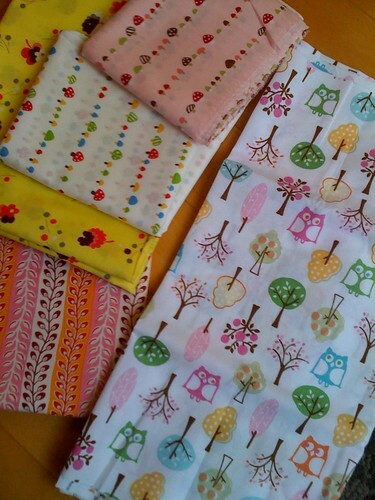 and get some owl sheets for my fabric stash. Nice work getting the owl fabric!!! 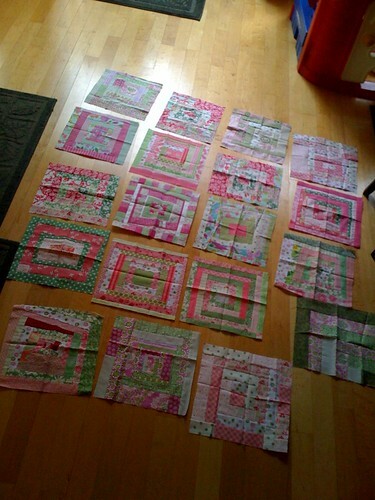 The quilt is going to look awesome, how many blocks have you got left to come in now? Oh, and congrats on being featured!!! Love the owl, and the fabrics are beautifull! That's so awesome! 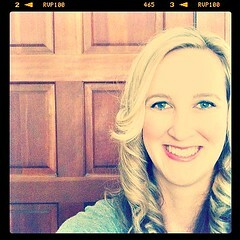 Off to check out the blog! I love that Brooke Owl fabric. Any suggestions on how I could get my hands on some without buying the sheeting new at PBK? I don't sew but would like to get some to custom order a carseat cover on Etsy. Any advice you have would be great! Wondering where to find the fabric it self? Any ideas?